DISCLAIMER: I have no formal affiliation with La Sportiva, however, they did provide me with a demo pair for my review. One of the first impressions of this shoe is the look, which is a bit more slick than the original Helios. Though it currently only comes in one color, the shiny black and yellow combo looks fantastic. The laces were a good length as well; I didn’t find myself stepping on them or running out of lace with different lacing configurations. The fit through the back- and mid-foot falls in line with other La Sportiva shoes. It is snug and really wraps the foot nicely. This is one of the things I love about their shoes; I don’t have to worry about heel slipping at all. You come to expect a snug, narrow fit with La Sportiva shoes, but it was in the forefoot that I experienced problems with the Helios SR. With the addition of the rock plate, they didn’t seem to adjust the height in the toe box. So what is normally a comfortably snug forefoot now feels really cramped (even after sizing up 1/2 size from what I wear with the original Helios). I also noticed that at the bend of the upper near the base of my big toes I was experiencing some discomfort/bruising after a few miles. This may have been exacerbated by the fact that they already fit rather tight. It did seem to loosen up after putting some mileage on the shoe, but never totally went away. This run was a relatively flat out and back with a short steep climb at the beginning and descent back down at the end. This run had some muddy spots off and on, allowing me to test the traction. The one thing I like about the “banana groove” design on the Helios outsole is that they provide great grip and flexibility while also shedding mud nicely. I didn’t really have any issues through the few muddy patches and was able to maintain my speed for the most part. It was on the uphill and downhill that I really noticed the restrictiveness in the toe box. While it wasn’t overbearing to deal with, it didn’t really make me fall in love with the fit either. For this run, I wanted to add a bit more distance with a couple minor obstacles thrown in. The good thing is that even though the fit was snug it resulted in very little friction from shoe movement and, as a result, I had no signs of blisters. That being said, my opinion didn’t really improve about the fit. Traveling over a few small sections of rock allowed me to confirm that the outsoles do indeed handle exceptionally well like most other La Sportiva models. The rock plate also resulted in a smoother ride. The outsole did not really change from the original Helios, which means that this shoe is super grippy. I love the Helios platform on any surface, from wet, bare rock to dry, loose gravel…it just eats that stuff up and creates a great sense of confidence while running. The addition of the rock plate did in fact provide an ample amount of underfoot protection. The toe box is way too shallow. La Sportiva’s are already known for their snug fit. It feels like when they added the 3mm rock plate in the front of this shoe, they failed to adjust the toe box. My feet felt cramped immediately…can’t imagine what it would feel like with a little bit of swelling. The area on the upper where the toes bend seems to cause some minor bruising/irritation. With a little bit of break-in time, they loosened up a little, but it never fully fixed itself. I hate being overly harsh, especially because my opinion is only one in a sea of different personal experiences, but I do feel that even with the improvements the Helios SR took a step back from the original Helios. I have run in La Sportiva shoes far more than any other trail shoe brand and therefore have come to expect near perfection from them. Perhaps this is unfair and I have become spoiled, but it is what it is. I will still wear this shoe, but I anticipate limiting it to runs of under 10 miles. Beyond that they start to become too uncomfortable for my taste. I would prefer not to size up a full size to adjust for the narrow toe box because I would worry about losing the trademark La Sportiva fit in the rest of the shoe, but this might be the best option for this model. I would rather see La Sportiva open up the toe box a little more in the next iteration and hope they do so. 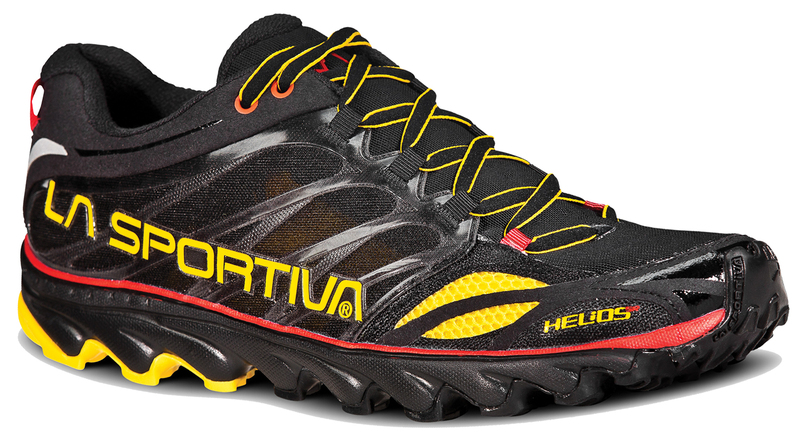 This entry was posted in Gear Reviews, Shoe Reviews and tagged Helios, Helios SR, La Sportiva, shoes, trail, trail running, ultrarunning by Ultrarunner Joe. Bookmark the permalink. I love your reviews, it seems that all of them end in…”I don’t see myself running long distances in them”, I would love to hear what you do wear for long distances and the pros/cons of those shoes. Thanks in advance. Great website! Ha…not ALL of them! 😉 I have run long distances (50K+) in many, but I guess I am rather picky. Most recently it is the Topo MT2, but I could also add to that list Hoka Challenger ATR, Scarpa Tru, and Salomon Sense to name a few. I also had the original Helios and loved them. Then I got the Helios 2.0 (not SR) and first thing I noticed was the toebox had gotten narrower. So now I’m super disappointed to hear that the SR also has a shallow toebox. Two big strikes. That’s too bad because I think the rock plate is a necessary option in the Helios over the 2.0. Strike three comes with the fact that the tread doesn’t even last 150 trail-only miles. Both my originals and 2.0 tread wore out way too fast.